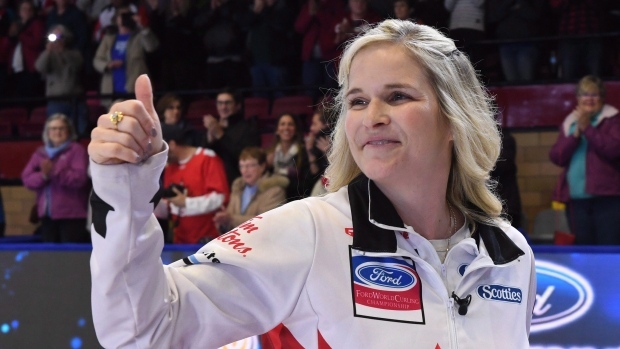 Curling Canada is planning to craft a rule exemption in order to allow an altered Jennifer Jones squad to return as Team Canada at the 2019 Scotties Tournament of Hearts. Under the current setup, a team must have at three of the four members from a winning team return. Jones beat Team Wild Card's Kerri Einarson to win the national championship last month in Penticton, B.C. The Manitoba lineup included Jones at skip, lead Dawn McEwen, second Jill Officer and substitute Shannon Birchard at third. Vice-skip Kaitlyn Lawes did not play because she was preparing for the mixed doubles event at the Winter Olympics. Officer, meanwhile, recently announced that she would be stepping away from competitive curling at the end of this season. That leaves Jones with only two returning members from her 2018 Scotties roster — one short of the minimum — for the 2019 playdowns in Sydney, N.S. next February. However, Curling Canada high-performance director Gerry Peckham said that a rule exemption was warranted in this case due to the unexpected scheduling conflict with the Games. "The original rule never contemplated the possible impact of a mixed doubles team on a lineup at the Scotties or the Brier," Peckham said Wednesday from Ottawa. "So the three-of-four rule obviously needs to be rewritten to factor in that possibility now that we know it exists." Lawes, who won gold at the Pyeongchang Games with John Morris, returned to the Jones rink for the recent world women's curling championship in North Bay, Ont. The Winnipeg team defeated Sweden's Anna Hasselborg to win gold. Jocelyn Peterman will replace Officer at the second position next season. Birchard, who served as team alternate at the world championship, plans to join a new team. Lawes was listed as an alternate on the Scotties roster, but under the three-of-four rule players need to be in the regular on-ice lineup. An automatic berth was first given to the defending champion at the Scotties in 1986. The mixed doubles discipline, meanwhile, was added to the Olympic program for the first time in Pyeongchang. "Rules on occasion don't necessarily always capture the intent or the essence when applied to every scenario," Peckham said. "Obviously the rule was written without any consideration for the reality that presented itself with Kaitlyn Lawes being with John Morris in Korea while her team — which she (normally) would have been a part of — was participating in the Scotties. "So should there be a punitive consequence because we missed that? I don't think so. I don't think anybody would be seeking that outcome." Peckham said Curling Canada generally looks at potential rule adjustments every quadrennial, but added there is more flexibility to adjust event-based rules — like at a Scotties or a Tim Hortons Brier — based on situations that may arise. He also noted there will be some tinkering done to the current wild-card eligibility rule that was used for the first time at the Scotties and Brier this season. With both fields expanded to 16 teams, a play-in game was used to determine the last berth at both events. The two highest-ranked teams who played in provincial/territorial championships were eligible to become Team Wild Card. However, that provincial/territorial provision excluded teams who may have had scheduling issues due to their participation at the Olympics. "We have a couple of adjustments to make because the wild-card is a new function or feature that may be around for a while and obviously mixed doubles is here for a while," Peckham said. "So rules are going to need to be updated to ensure that all those things are covered." The three-of-four rule has previously affected teams at the men's national championship as well. In 2014, skip Kevin Koe announced plans to join a new team after winning the Brier. His former teammates — Pat Simmons, Carter Rycroft and Nolan Thiessen — all needed to return in order to keep their Team Canada spot for the 2015 Brier. Morris later joined the foursome and Rycroft put retirement plans on hold so the team could return as defending champions.